A cottager’s plot was small, so gardens were jam-packed with plants for maximum productivity. In the Elizabethan era came increased prosperity, which meant that cottagers could afford to grow more flowers. Some of these still had functional uses, such as violets, which were spread on cottage floors as their scent deterred vermin. Other flowers, though, such as hollyhocks, were grown for their beauty alone. 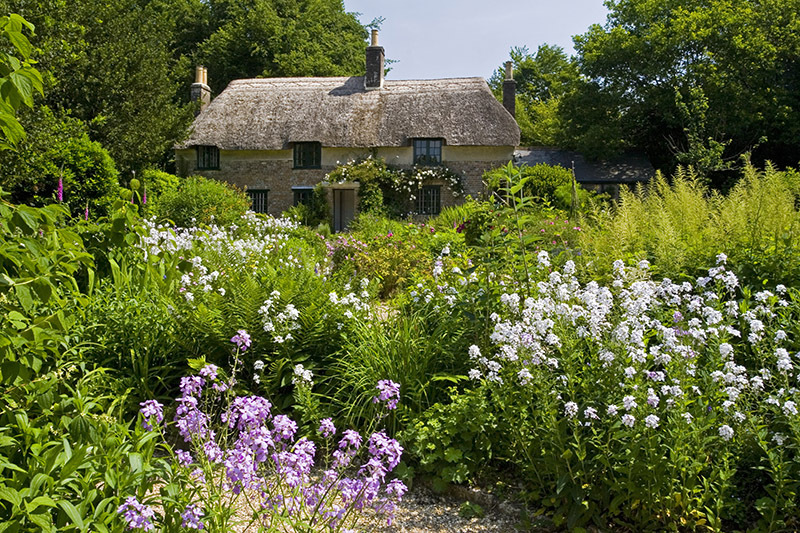 The cottage garden as a self-conscious “gardening style” is much more recent, dating back to the late 19th century. It was popularised by influential gardeners and garden writers Gertrude Jekyll, William Robinson and Vita Sackville-West, as well as by watercolourists Myles Birkett Foster and Helen Allingham, who created “chocolate-box” views of tumbledown cottages with flower-filled front gardens. The Victorian middle classes became enamoured with the style, which suited their relatively small houses and gardens and tapped into their collective nostalgia for a simpler, pre-Industrial age. Nowadays a “cottage garden” can be defined by an apparent informality of planting, abundant borders, a mixture of flowers and herbs, sometimes also fruit and vegetables, and the use of traditional materials, such as hazel sticks for wigwams. There is nothing pretentious about a cottage garden. In June 1840 the novelist and poet Thomas Hardy was born in the small cob and thatch cottage that forms the backdrop to this timeless cottage garden. It was here that he wrote his earliest novels, before designing Max Gate, a large Victorian villa situated nearby, where he lived from 1885 until his death. The garden, divided into a front cottage garden, side vegetable garden and an orchard beyond, does this very well indeed. The front garden is jammed full of old-fashioned flowers, with not an inch of bare soil in sight. Among the floral stars are hollyhocks, lupins, aquilegias, honeysuckles and rambling roses, which Hardy particularly loved. Visitors to Beatrix Potter’s garden at Hill Top may get a strange sense of déjà-vu. This might be because it is reminiscent of Helen Allingham’s famous watercolours of cottage gardens. But more likely it is because the garden appears in some of Beatrix Potter’s best-known and loved books, including The Tale of Tom Kitten. 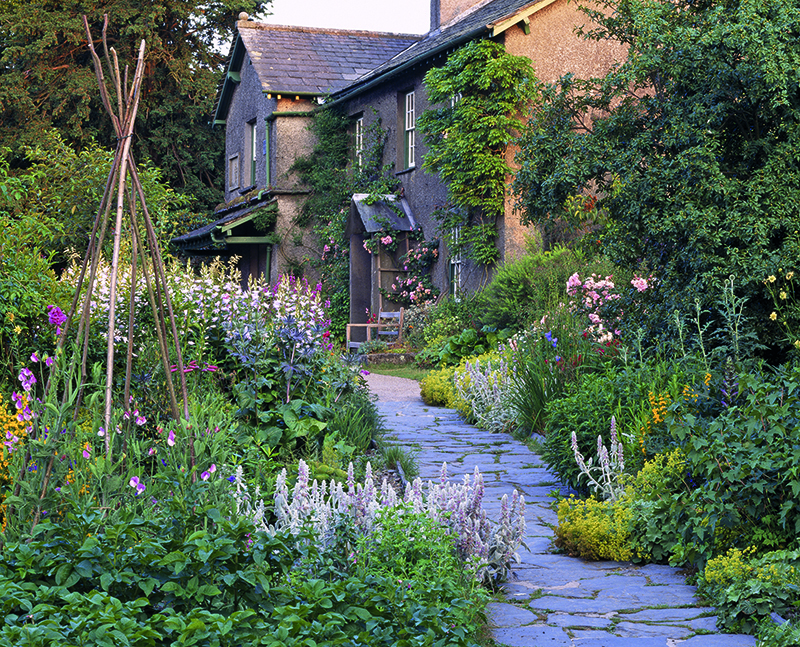 Beatrix Potter planned and planted her garden at Hill Top, obtaining plants from other gardens in the village of Near Sawrey, as well as sourcing particular species from London. “We try as far as possible to make the garden look like it would have when Beatrix Potter lived there,” explains Pete Tasker, the gardener at Hill Top. “The garden is pretty much pure cottage garden style – vegetables, fruit, flowers and shrubs are all mixed together, with a smattering of weeds to add to the authenticity.” This small third-of-an-acre plot boasts an abundance of cottage-garden favourites – which Beatrix loved – including roses, lady’s bonnets, lamb’s ears, poppies, sweet peas, lilies and irises. Plants spill out romantically over a slate path that leads up to the front door of the cottage, itself festooned with climbers, including a white wisteria, a Japanese quince and a prolific Clematis montana. “What visitors enjoy most is that it often reminds them of gardens from their childhood – and kids love it because of its associations with Beatrix Potter’s tales,” says Pete. Beyond the front garden with its bustling borders is a walled fruit and vegetable garden. Here too, nothing is overly manicured. Tall evening primroses have been left to self-seed adding height and drama to the spectacle. In the walls are the original bee boles – specially designed cavities that would have housed traditional straw bee skeps. If you spot the rhubarb patch, you may recognise it from an illustration in The Tale of Jemima Puddleduck. In the neighbouring paddock is a mixture of fruit trees – apples, damsons, plum and pear. The largest – a Bramley – may even date from Beatrix Potter’s time. The author, poet and grande dame of gardening Vita Sackville-West described Hidcote as “a cottage garden on the most glorified scale”. Covering 10 acres, Hidcote is, indeed, vast. But essentially it is a series of small enclosures, or garden rooms, many of which have the feel of a cottage garden. Like in any true cottage garden, plants mingle together in beauteous luxuriance: climbers clamber over hedges and walls, herbaceous perennials merge with tulips and other bulbs, self-seeders poke through cracks in the paving and fill patches of bare earth. Sackville-West called Hidcote “a jungle of beauty” but, as she pointed out, this was “a jungle controlled by a single mind; never allowed to deteriorate into a mere jungle, but always kept in bounds by a master hand”. The master in question was Major Lawrence Johnston, who moved to Hidcote in 1907. 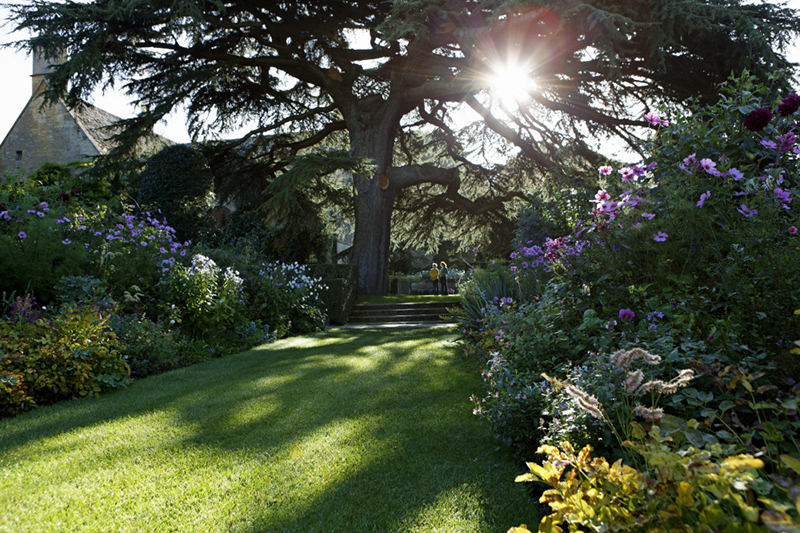 Over the following 41 years, this self-taught gardener and passionate plantsman created one of the most influential gardens of the 20th century, now lovingly looked after by the National Trust. The garden features about a dozen “outdoor rooms” divided by high hedges of holly, hornbeam, yew and beech, creating a wonderful feeling of secrecy and intimacy. Cuttings in hedges offer tempting glimpses towards other parts of the garden, while paths and alleys lead you on a beguiling journey of discovery. The Old Garden is particularly “cottage” in its planting. In spring, masses of tulips dominate the vast mixed borders creating a dazzle of colour, while in late summer dahlias take centre stage. Another key cottage feature at Hidcote is the pretty topiary. As Sackville-West rightly pointed out: “There is just enough topiary to carry out the cottage-garden idea; just enough, and not so much as to recall the elaborate chessmen at Hever Castle or the tortured shapes at Levens Hall. The topiary at Hidcote is in the tradition of smug broody hens, bumpy doves, and coy peacocks.” Lovely. Charmingly informal and filled with a joyous abundance of plants, East Lambrook Manor Gardens capture the essence of the modern cottage garden. Nowadays described as “the home of English cottage gardening”, in the 1940s to 1960s East Lambrook was the home of journalist-turned-gardener Margery Fish. In 1937, sensing that war was imminent, she and her husband Walter bought a 15th-century manor in rural Somerset to escape possible dangers in London. With no previous horticultural experience, Margery Fish transformed her two-acre wilderness into a rambling garden of tiny, twisting pathways and discrete spaces – from sun-drenched borders and free-draining areas to shady spots and boggy corners. Each one was filled with hardy yet beautiful plants, specifically suited to site and soil. Innately gifted, Margery Fish blended old-fashioned favourites with contemporary plants, creating dazzling and inspirational mixed borders. Unlike many of her predecessors, she delighted in tending her plot personally, rather than employing a gardener. She realised that by using strong hardy perennials, good ground cover plants that smother weeds, as well as pretty self-seeders, a garden could almost “look after itself”. These were just the kinds of solutions that post-war cash-strapped garden owners were looking for – no wonder the style was to have such an impact during the second half of the 20th century. Over the past 25 years East Lambrook Manor Gardens have undergone major restoration work, underpinned by a project to catalogue and source all the plants that Margery Fish used in her garden. Today, the gardens are testament to their original owner’s vision and visitors should allow at least two hours to enjoy the variety and range of plants, the delightful café with home-made cakes and Somerset apple juices, the exhibition room with local arts and crafts, and the well-stocked nursery, where many of the plants in the garden are for sale.